I just listened to a great lecture on “Seven habits of Highly Effective Artists” by Andrew Price from Blender. I personally really enjoyed this talk and believes it applies to all artists whether it be traditional, digital, photographical, design, writing, music, whatever! It can be easy to lose motivation to put time into your craft but these steps really put into perspective how easy it is to reclaim your passion and dedication for art. Do give it a listen if you have a spare moment he brings up some great point - I just listened while I folded my laundry! I’ve listed the seven key habits and where abouts to find them in the video below. The only one I don't agree with is the Create What You Love. You HAVE to branch out and break out of your boundaries, you can't always just stay drawing cute girls and what not. You have to challenge yourself. As an artist, you have to be versatile. A lot of opportunities are in the works for Kiwis Can Fly which I can’t delve into but it is all very very exciting! I just realized that I never uploaded a link to the trailer for Kiwis Can Fly to my blog so here it is. More to come so watch this space! Today I just wanted to discuss an amazing artist that I happened upon recently while having a look through vimeo called Gian Luca Mauotti, more specifically his work on “Free to Roam” a music video for musician Giagrande (link for for video below). Maruotti is an italian freelance illustrator, puppet maker and stop motion animator/director. I really admire the stylization and precision of his work and would love to do an artistic study in to develop my own art specifically in my own character designing. If you have the time do check out his work it’s amazing! Had an awesome dinner at Ghengas Khan with my good friends from the Kiwis Can Fly crew. It was lovely to catch up with everyone and see what everybody is up to post finishing with uni. It made me realize how much I miss working with these talented guys on the daily. I hope we get to work together again soon on Kiwis Can Fly and other exciting projects. Love you all! I attended an awesome WIFT workshop lecture at the Random Group headquarters about EPK’s and BTS’s as well as the importance of taking them into consideration when setting aside your budget. It was really interesting to learn more about EPK’s given they are something I hadn’t heard about before recently so now I understand it a lot better. It was really nice to see some familiar and meet some new faces. I really do enjoy attending these events and meeting other filmmakers so I am excited to attend next years workshops. Yesterday I had the pleasure of catching up with an old friend of mine, Emily French. During my second year of university I interned on her 3D animated major project called “Tinker” as an animator/modeller. Working on Tinker taught me a lot about animation production that I hadn’t considered before. Working with Emily as an intern helped me to understand production for animation which I later implemented into my own practice this year with Kiwis Can Fly. We caught up on my experiences this year directing and producing Kiwis Can Fly and laughing over mutual PTSD about render farms and managing such demanding projects. Emily is currently working at South Pacific Pictures which is very exciting and I am glad to hear that she is enjoying her work so much. I wish her all the best for the future and hope to see some creative works from her again soon! 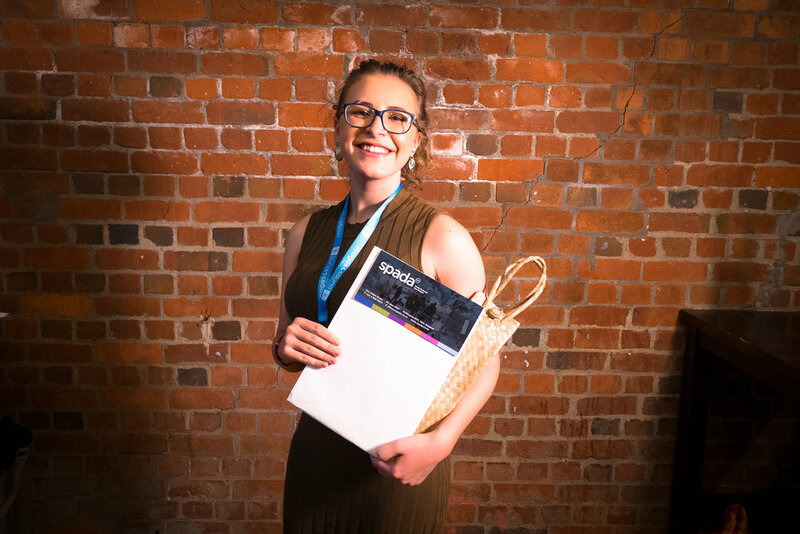 On Thursday my major project Kiwis Can Fly which I directed and produced this year for my final year at Massey University won this years Big Pitch Competition at the 2018 SPADA Conference. This opportunity will send me and my project to international market next year in Miami to Kidscreen2019 to share Kiwis Can Fly with world industry professionals and commissioners. I would really like to nail in there about how much winning this meant to me. Especially for a project in which I have put my heart and soul into for the last year. There have been ups and downs during this year but it makes me so happy to see all that hard work pay off and see others believe in the worth of my content. If you were there you probably saw me embarrass myself during my acceptance speech but I would love to give a special thanks to SPADA, my amazing team who helped turn my vision into reality this year and my family and friends for their endless support. It’s been a while since I last logged a progress update. I have been working tirelessly all year creating an animated series called “Kiwis Can Fly” for possible distribution on TVNZ’s HEIHEI platform. This project has definately been my baby this year in which I have put my heart and soul into making so it is quite surreal for me to think that it’s finished. I’m Keeping my fingers crossed for any opportunities to continue this dream to take Kiwis Can Fly to the world! Exposure 2018 at Massey University! The first showcasing of Kiwis Can Fly Episodes and Mixed Reality Game. After much preparation my team and I finished all of our voice recordings needed for our mini series Kiwis Can Fly. Our talented young actor, James Catherwood, came into the studio last Tuesday to perform the role of Kori the Kiwi. I can't praise the talent of James enough, he was great to work with, applied direction and critiques extremely well and delivered all lines flawlessly. I can definitely foresee a bright future for this young actor in the performing arts industry and really hope I can work with him again in the future. It was loads of fun directing this recording session with my amazing team mates Joshua Tong and Andrew Peek I was very pleased with the quality in recordings we were able to complete in such a short amount of time. Once the recordings have finished being mixed we will be moving onto episodic animation. I am very excited to see some animated visuals. This morning I met up with the amazing Amie Mills for a coffee at the Milk Crate. During the beginning of the year Amie was the Head Children's Digital Content Commissioner for the online platform HEIHEI and my former external supervisor from TVNZ for major projects at school. Currently, in the last few months Amie has left TVNZ to work on new projects with NZ on Air commissioning for public channels on New Zealand television. Because of this Amie had to hand over the reins of supervisor to another capable co-worker Kate Simmonds, who has been great to work with. Although I was sad to see her go it was really nice to catch up with her and discuss projects, aspirations and updates on current exciting projects. It is really awesome to talk with someone who is so passionate about New Zealand digital content, content for children and other unvisited facets of media. I wish her all the best at her new job and know that she will do amazing things in the future with NZ on Air. Today I met with Dale Corlett who is the Head of Talent Development at the New Zealand Film Commission in Wellington. Dale and I got to know each other a bit better and talked about the current projects I am working on as well as funding initiatives that may apply to myself as a professional as well as my up and coming project 'Kiwis Can Fly'. He gave me some great insight about the current state of the film industry and the lack of female directors and producers right now. It was really encouraging and insightful to talk to someone who has a very realistic advice about how to get to where I want to be. The team at the New Zealand Film Commission are truly amazing and I would definately recommend getting in touch with them if you are an aspiring director or producer. 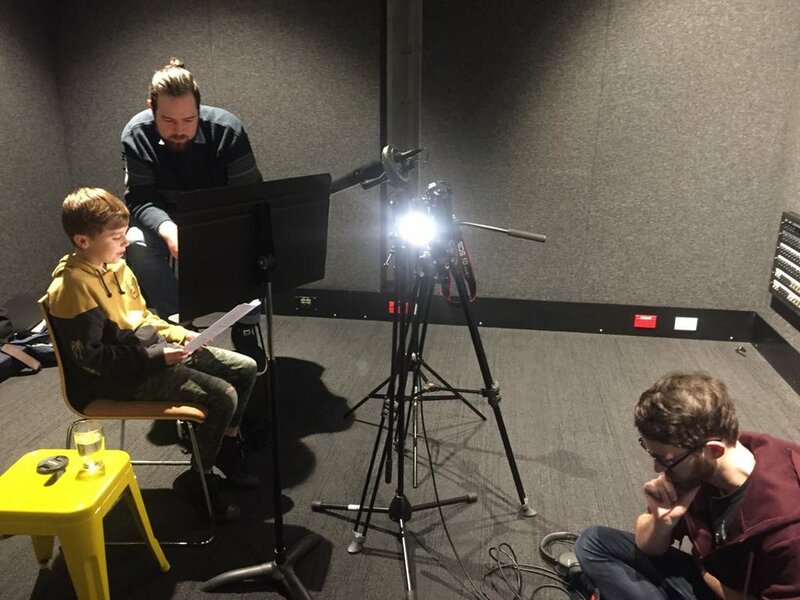 After going through roughly 75 applicants and auditions for our major project, "Kiwis Can Fly" my Co-Producer, Joshua Tong, and I conducted our final callback audition session with a few child actors. Hosting and directing auditions with child actors was definitely a new experience for me but I am really happy with how it went. There definitely is a knack of communication and patience involved in getting the best performance from the kids. So, I was extremely pleased when we decided on our lead voice actor for Kori the Kiwi. With this casting process came the responsibility of writing legible contracts and agreements for the guardian of our talent. This has been a very interesting and insightful process that I have learnt a lot from using references from school, guest lecturers, contract law and written content such as the Actors Guild 'Pink Book'. I am grateful to have had such great guidance from one of my tutors from Massey University, Nicci Boucher. Courtney setting up scripts and schedules for callbacks. I went to an amazing lecture by 2D Animator and Motion Graphics designer Laura Yilmaz. This lecture was hosted by Victoria University's Mirimar Creative Center out on Park Road so it was very cool to see the facilities they have out there. Throughout her lecture Yilmaz gave us a rundown of her personal history and experiences as a creative media maker as well as the companies and jobs she has worked on which was really interesting. I especially enjoyed hearing about the current game she is developing with her partner called 'Thin Air'. The visuals of this game look amazing and I am very excited to see more of this work from her. I really enjoyed the concept and the look of this production as it reaches out to a more alternative audience of gamers - perhaps even a more mature generation. It explores the themes of motherhood, loss, loneliness, identity and purpose which I thought was really neat. If you want to check out more on the work being done for this game - which I highly recommend looking into, I will attach a link below. 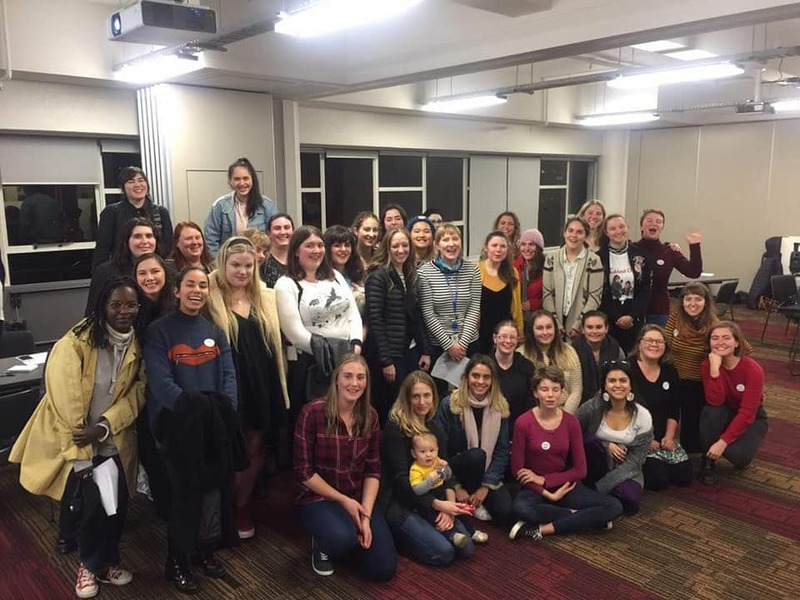 Last night I attended a event at Victoria University with a variety of other women who are all passionate about filmmaking and want to join a group of like-minded women. The purpose of this group/community is to help and support each other's talent and growth in a supportive, empowering environment. 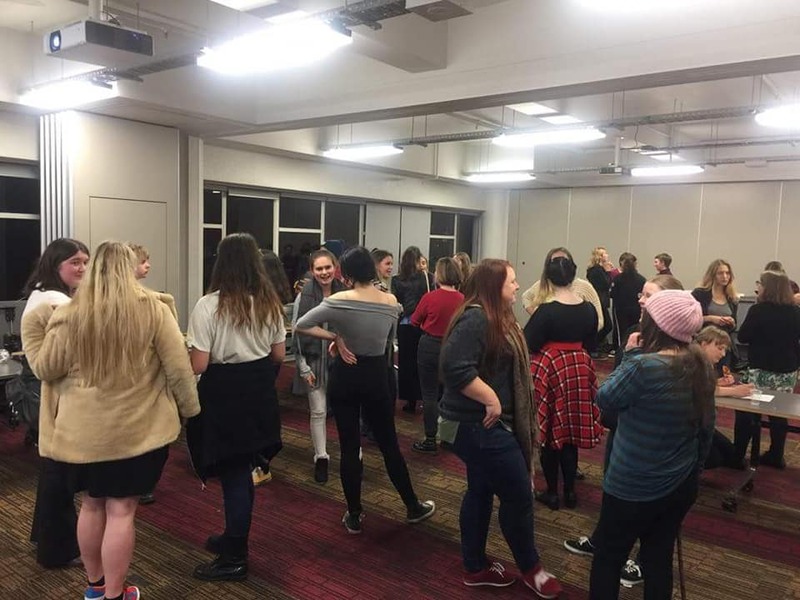 I am already a member of WIFT, however the premise of this group is more for young women, or women of any age, who are just starting out and wish to pursue a career in the film and television industry. This event was really fun and a great opportunity to hear about what everyone is working on currently as well as share a variety of aspirations and dreams. Going into a male dominated industry can be quite intimidating for some so I think this is a great support system to be involved with a group that will help to support and encourage one another. Going into this event however did make me realize how little women I have met with an interest towards animated filmmaking content. I haven't met too many in this interest area, being that it is a passion of my own and my dream to create animated content I would love to find a group for women in animation. In further investigation today I have found there is an existing organization for these like minded people. However, I am having a little trouble locating the New Zealand Branch of it. So if anyone has any information to give me on how to find these people, I would love to hear from you! Today Jessie Grosser and I met for a nice catch up today at a lovely cafe called the "Milk Crate" which was a really awesome place with great service and food which was really nice. Jessie currently works at the New Zealand Film Commission in Wellington and we met at the end of last year at Terror-Fi Film Festival which I was volunteering at. Still good friend to today, we try to catch up every month to see how each other are doing and update each other on what projects we are currently working on which is always exciting to hear about. 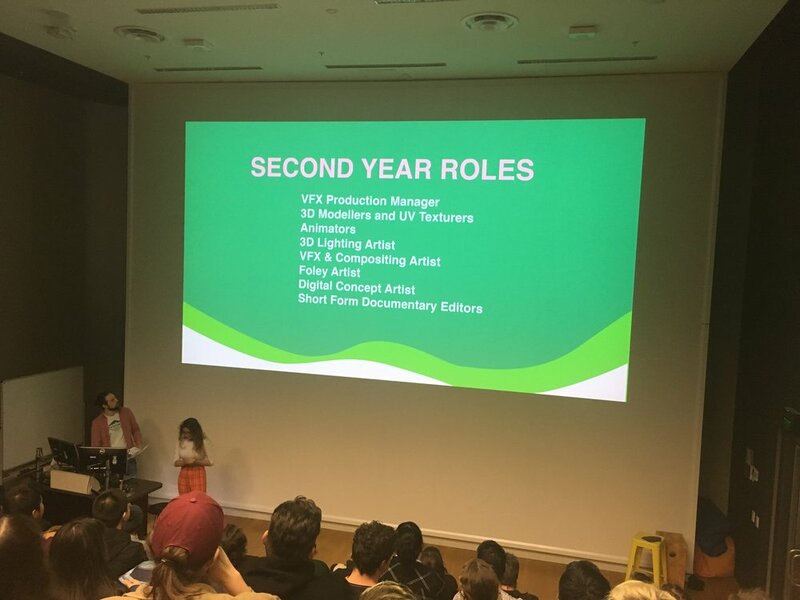 Today Jessie and I spoke a lot about funding initiatives available and gave me some great advice on furthering my career as a director and producer in the New Zealand Film industry. It is always great to get advice and feedback from someone with industry experience to point you in the right direction when you are unsure what steps to take next. She has been a great mentor to me throughout this year and I have continued to learn more and more from her. Heading toward new and more exciting adventures overseas Jessie will be leaving to the UK soon which I am sad to see her go but excited this new adventure in her life and wish her all the best for the future. To continue my last post here is a character VFX break down that of our secondary supporting character Moemoe the Takahe. Mōeōe is Kōri’ closest friend. Although rather unenthusiastic in comparison, Mōeōe is always happy to lend a hand with Kōri’s inventions and assist him in his endeavours. Mōeōe’s favourite pastimes include hanging out with his friend Kōri and napping. In this video you will see a VFX breakdown of; controls/rig, animation pass, jiggle physics as well as a skin and fur pass. Thought I might post some recent character developments from my major project I am directing/producing and visual developing which is a 3D animated children's tv series called, "Kiwis Can Fly". Below is a character VFX break down that my team and I have been developing over the last month and a half. You will see a breakdown of: controls/rig pass, animation pass, jiggle physics, skin and fur pass for our main character Kori. Our main character, Kōri, is a feathery ball of unbridled enthusiasm and curiosity. There is no obstacle that Kōri can’t overcome - except for flying, but that won’t stop him from trying! With his can-do kiwi attitude and innate DIY know-how Kōri is determined to construct a series of contraptions and gadgets to assist him in his quest for flight." 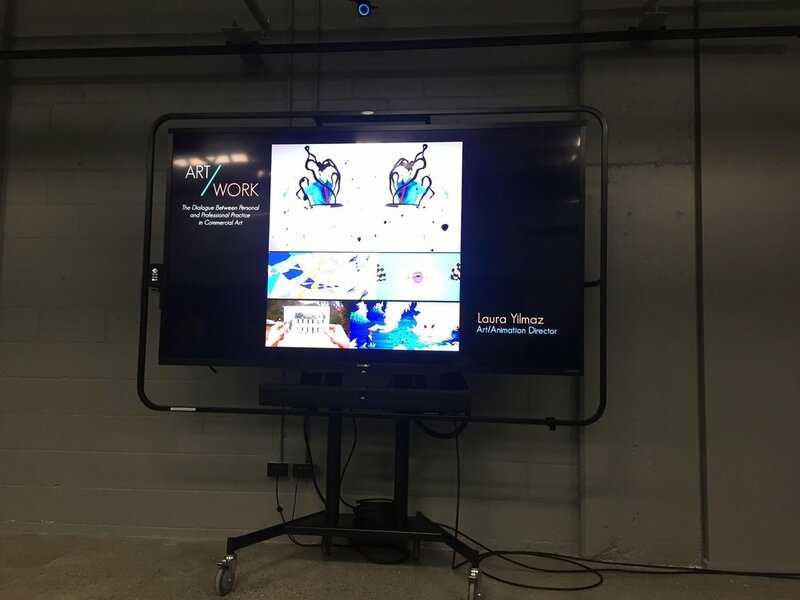 Today we had the opportunity to pitch our major projects to second year Creative Media Production students in the hopes of recruiting them to work on our major projects next semester. The purpose of recruiting second year students is not only to quicken the pace of production but to also give them an opportunity to learn the process of working under management and time restrictions. They also have the opportunity to learn from the third year students more technical skills in the fields of work that they want to learn more about. I may be biased, however, I believe that my teams pitch was the most impressive and well presented project. My Co-Producer Joshua and I were able to get across lots of information about our project in five minutes. This included our log-line, elevator pitch, character descriptions, character turn tables, rendered character walk cycles with technical breakdowns on both characters (included; animation, rig controls, mesh, jiggle simulation, Xgen fur simulation and texturing), episode one animatic with VA and foley, environment concept design, roles available in our team as well as answer any questions. We got great audience reaction to our characters which was a lot of 'ooohs', 'aaaahs' and 'awws' which was fantastic. Unlike other teams we weren't relying on production/client names, confectionary or unconfirmed promises to draw in our recruits. We let the work we had managed to produce over the last seven weeks do the talking for us. My teams skills, ability to produce high quality work and determination to make this project something worth while was our selling point. This helped to elevate our project above others. "Great presentation. The audience reacted really well to your presentation...Clearly it connects to people. It's a cute story with cute characters and environments. This team is motivated and everyone works hard. It really shows in the quality and potential of the work." - Justin Rotolo, Animation Tutor. "I don't have any questions, I just wanted to say how amazing your presentation was and the amount of work you guys have produced in such a short amount of time is really impressive." - Second Year Student Audience Member. Today my class and I had the amazing opportunity to listen to a lecturer by the amazing Andrew McGee, Animation and Creative Director at Teaspoon Films and Verso VR. Andrew showed us some shorts from his own reel and the experience he had with each particular project. It was awesome to see animation adverts that I have seen growing up on television and being able to pair those with their creator. My major project team and I were able to ask him a lot of questions in regards to our own project and how he would approach some possible hiccups we had predicted and just general knowledge of his experience in animation. I really appreciated the opportunity to talk with an industry individual in the animation field and get my team inspired. Feel free to look at their website using the link below, the Teaspoon team has made some cool stuff.